View More In Napkin Rings - Page 2. Love Jungle inspired exotic décor & dramatic tableware? 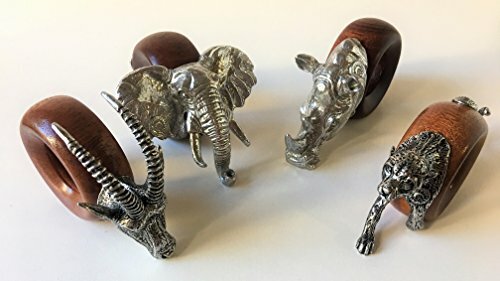 Made in South Africa, artist designed and signed set 4 African Jungle animals, cast pewter and wood rings. This is design B, including an Elephant, Cheetah, Rhinocerous and Sable. Miniature sculptures, use on table or as decoration. There is another set of Design A with 4 different wildlife animals if you want to mix and match. Set 4 Cast Pewter and Wood artist designed & signed Napkin Rings, including Elephant, Cheetah, Rhino, Sable. Pewter and Wood, natural variations in color to the wood. Made by Makoulpa, artist stamp on each figure. Substantial weight and size, approx 4-5" each design. Outstanding highest quality, perfect for discriminating hostess and guests. If you have any questions about this product by Makoulpa, contact us by completing and submitting the form below. If you are looking for a specif part number, please include it with your message.